A South Carolina man has been charged with the kidnapping and brutal murder of a 21-year-old University of South Carolina student from New Jersey who mistakenly got into his car, thinking he was her Uber driver. Democrat aspberger's and sense of superiority on display here. How do you communicate when there is a lack of social grace. Schiff has received a new wave of criticism after Robert Mueller’s investigation, according to a summary by Attorney General William Barr, cleared President Donald Trump and his campaign on any collusion with Russia. Schiff has said in the past he had conclusive evidence that Trump did collude with Russia. The further left you go the more you're into the cult of the personality...the Smollett hoax and his protectors. To say this is a strongly worded letter is a bit of an understatement. Excerpts from the letter are as follows. The letter then goes on to cite specific laws that may have been broken by Foxx’s conduct. To start, her recusal that wasn’t really a recusal is a big issue. The question will be whether her statement of recusal is enough to trigger the fact that she then didn’t follow state law in response. Common sense is rarely common in matters of law, but why would this law exist if it can simply be skirted by saying “well, I didn’t really recuse you guys!” when someone is caught breaking it? It goes on to point out more possible illegality (or at least unethical behavior) by Foxx’s office in their handling of the sealing of the case, as well as the use of an emergency hearing. Clearly, Foxx and her office lied to the public about sealing the case. She’s now trying to walk that back by claiming it was accidental but that makes no sense given their initial assertion it was mandatory. Also, because they did not give law enforcement the proper legally required notice, her office may have also broken the law in that regard. Chicago PD has the right to object to the sealing of the case and that was not provided for them in this instance. Lastly, the Illinois Prosecutors Bar tackles the blatant lie that the deal given to Smollett is standard practice. To be frank, it’s simply not. It’s essentially unheard of and that’s backed up by this letter. They close out the letter with further admonishment of the highly question behavior that went on here. This is not going away. If I were to guess, I’d bet that Kim Foxx is regretting her decision to try to whitewash this case. I don’t know if she really thought she could get away with it or if she thought this would pass as standard politics in Chicago, but the entire country has taken notice. She’s being barraged from all sides, not by partisan sources, but by others in her profession, including some who have the power to disbar her. A day ago I would have laughed at the thought that she may be forced to resign, but it’s a real possibly now. If the Chicago PD make good on its threat to Smollett and takes him back to court over the $130,000 he cost the city, this is going to go from bad to worse for Foxx. Time to venture boldly through the looking-glass … Sen. Rand Paul is among the millions who think so. The Republican senator from Kentucky effectively blocked a resolution Thursday that called for the public release of Special Counsel Robert Mueller’s report. Objecting to the resolution, he argued that the communications of officials in the Obama administration be released first, to include those of former CIA Director John Brennan and Former FBI Director James Comey, as relating to the beginning of the Russia probe. Others no doubt among that vile cartel would be Peter Strzok, Lisa Page, Andrew McCabe, Bruce Ohr, James Clapper, Susan Rice, and Loretta Lynch. Sen. Amy Klobuchar, Democrat from Minnesota and 2020 presidential candidate, had asked for unanimous consent in the Senate for the resolution. The measure passed in the House in February by a 420-0 vote. She declined to amend the resolution as outlined by Paul. This is actually the third time Senate Republicans have blocked the resolution. “We will agree to see the Mueller report as long as the other side will agree to show us the communications that took place in deciding to promote this fake allegation against the president and whether there was misuse of their office,” said Paul on the Senate floor Thursday. “We based this investigation on a lie, we should investigate who the liars were. Democratic presidential candidate Robert Francis O’Rourke, a former congressman from Texas, said Sunday, “You have a president who, in my opinion, beyond a shadow of a doubt, sought to, however ham-handedly, collude with the Russian government, a foreign power, to undermine and influence our elections.”"
Amid her zeal to save the world with the Green New Deal, Rep. Alexandria Ocasio-Cortez has ignored residents in her own Bronx back yard. Making access all the more challenging for her constituents, Ocasio-Cortez has yet to open an office in The Bronx. Apparently not all kids are 'off limits' in politics...disgraceful Democrats. The political rule about kids being off-limits is very selectively applied in general, and like other political boundaries under over the last few years, is especially subject to transgression if President Trump is involved. Take the case of the Special Olympics, for example. Education Secretary Betsy Devos has been under fire from Democrats for days over Dept. of Education cuts that would affect funding for the organization that provides athletic opportunities and competition for for children and adults with intellectual and physical disabilities. Ostensibly the outrage is born of an abundance of compassion and caring regarding those opportunities and that mission. But for a few Ohio Democrats, it was more of an opportunity to take a shot at the President's minor son. Thomas LaDuke at RedState highlighted this week the Facebook postings of some prominent Democrats, including from Cuyahoga County, home of Cleveland, site of the 2016 Republican National Convention where Donald Trump accepted the party nomination. It is the second most populous county in the state, with a major urban center, and with a lot of the state's powerful party members. As Laduke notes at RedState, that incorrectly spelled reference was not the end of it. Not only were there similarly ugly replies from the Democrat politician's followers, but from fellow party members. Another lady who ALSO identifies as a judge in Ohio had this to add to Ellen's dumb statement. 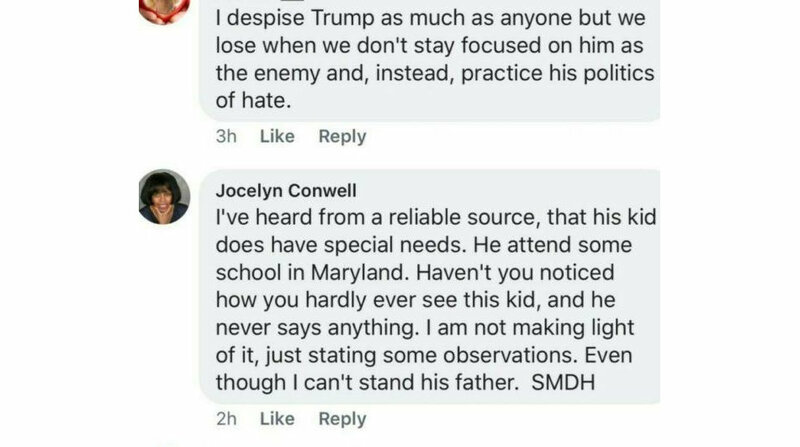 Jocelyn Conwell could not wait to contribute this nugget in an already gross thread. Laduke has more details here at RedState, including Conwell's credentials. In the second place, it is demeaning to the children adults who participate in the Special Olympics. By using participation in the games as a means to denigrate the President's child, they are implicitly suggesting that there is something denigrating about being in the games. 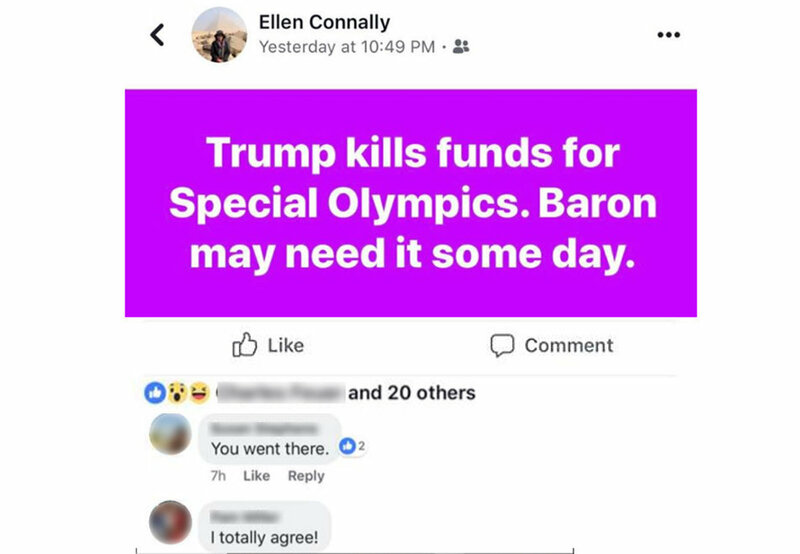 Any parent who has a child participating in Special Olympics should be proud of their kid's achievements, just like any other achievement, and insulted by those who think the games and the organization are a punch line in a political insult. In 2015, Obama halted exploration in coastal areas of the Beaufort and Chukchi seas and the Hanna Shoal, an important area for walrus. In late 2016, he withdrew most other potential Arctic Ocean lease areas - about 98 percent of the Arctic outer continental shelf.